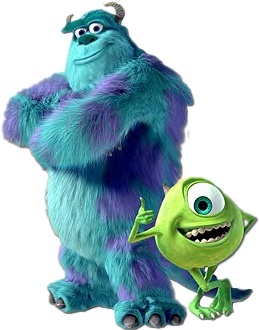 Sulley and Mike Wazowski are ready to help contribute to the Lost Media Wiki! Hi there! My username, as you can guess it, is Happy Brian. Brian is my name in real life and I am happy most of the time. I am a big fan of western animation as a whole (especially the works made by Disney and Pixar) and I am a big Nintendo console gamer (as well as a portable gamer). I am also a dedicated researcher at heart as I try to make sure that the facts listed on this wiki are correct. My profile picture at the top (if you are a mobile user) and on the side of my infobox's user page (if you are using a computer) are Mike and Sulley from Monsters, Inc. and to a lesser extent, Monsters University, two of my favorite movies made by Disney and Pixar. In my spare time, I love to watch videos on YouTube, watch movies and play video games when I have nothing to do for today or whenever I'm bored and want to do something else. I currently don't have any big plans for this wiki, but I just hope to contribute and make sure my fact-checking abilities are appreciated. I have been a reader of this wiki since January 2017 and created an account here on July 12th, 2017, but didn't get my email confirmed until August 31st, 2017. I'm a bit busy with life at the moment, but I hope it doesn't stop me from contributing to this wiki. NOTE: Since the wiki's new skin doesn't allow user profiles or UserWikis anymore, I've decided to integregate most aspects of both to my user page here. Favorite movies: Anything by Disney and Pixar (both 2D and 3D animated); some of my top favorites include Monsters, Inc., Monsters University, the Toy Story franchise, Zootopia, The Princess and the Frog, Finding Nemo, Finding Dory, the Cars franchise, Tarzan, Lilo & Stitch, Treasure Planet, Beauty and the Beast, Aladdin and Mulan. Favorite TV shows: SpongeBob SquarePants, Kim Possible, Danny Phantom, Avatar: The Last Airbender, The Legend of Korra, iCarly and Drake & Josh. Favorite musicians/bands: Taylor Swift, Coldplay, Bruno Mars, Metallica, Beyonce, Rascal Flatts, Evanescence, ABBA, Michael Jackson, Katy Perry and Kelly Clarkson. Favorite book series: Harry Potter by J.K. Rowling. My favorite specific book/film in the series is Harry Potter and the Prisoner of Azkaban. Favorite video game series: Super Mario Bros. (including all spin-offs), Super Smash Bros., Disney Infinity (all three installments), The Sims (the first two games) and the Wii series of games on the Wii and Wii U. Favorite YouTube channels: Cinemassacre, LGR, Phelous, Movie Nights, Stoned Gremlin Productions, Cinematic Excrement, Brutalmoose, Musical Hell, BrawlBRSTMs3 X, Linkara, and much more. Favorite foods: Pizza, Spaghetti, French Fries, Chicken Tenders and Ice Cream. Favorite drinks: Sprite, Lemonade, Grape Juice, Orange Juice, Apple Juice, Cranberry Juice and Pineapple Juice. Consoles and Handhelds I own: Sega Genesis, PlayStation 2, Game Boy Advance, Nintendo DS, Wii, Nintendo 3DS, Wii U and Nintendo Switch. 1 Daredevil: The Man Without Fear (cancelled PS2/Xbox/PC Marvel game; 2003) September 1st, 2017 I created this article based on my interest of this cancelled PlayStation 2, Xbox and PC video game due to be out in 2003 from Unseen64's video on the subject. I would have loved to play this game if it had actually came out mainly due to the "Shadow World" mechanic. 2 Super Mario RPG 2 (lost pre-release version of "Paper Mario" N64 game; late 1990s) October 11th, 2017 My first article creation on my favorite video game franchise of all time, Super Mario Bros. This article is based on the original iteration of Paper Mario and was originally meant to be an 64DD game, before it was changed to the Nintendo 64 game we know today. 3 Treasure Planet II (cancelled Disney animated film sequel; 2002) November 19th, 2017 Me and my sister are avid fans of the original Treasure Planet animated film (it's one of my favorite Disney animated films in general), so it comes off as no surprise that I wanted to create an article based on the cancelled sequel. Unlike most other Disney animated direct-to-video sequels that did see the light of day, I feel this one had huge potential to be just as good as the original. It's sad that the film's failure at the box office killed off any hope of the sequel being made. 4 Nintendo Pennant Chase Baseball (unreleased Nintendo GameCube baseball game; 2005) December 29th, 2017 This article is based on a completed, but never released baseball game for the Nintendo GameCube after it was repeatedly delayed. I think it was an interesting topic to cover and I did a lot of research on it to document its history. 5 Despicable Me 2 - Al Pacino dialogue (lost original audio of animated film; 2013) January 30th, 2018 I view Despicable Me 2 as a good sequel to the original, but I find the topic of Al Pacino originally being the voice of the film's villain to be interesting as a "what could have been" had he stayed in the final film. 6 SimsVille (cancelled "SimCity" and "The Sims" PC crossover game; 2000-2001) March 30th, 2018 I'm sorry that I didn't create an article in February due to my life being busy, but I did find SimsVille to be an interesting article to write about since I'm nostalgic over the first two games in The Sims series and though the game was cancelled, some aspects of it carried on to later games in the series. 7 Mega Man Universe (lost builds of unfinished PSN/XBLA game; 2010-2011) May 29th, 2018 Many have called this game the "predecessor" to Super Mario Maker for the Wii U and Nintendo 3DS (which I love on both systems) and I can see why while I was writing the article. Though I agree with the game journalists' that the game's art style wasn't that great, I would have been interested to see how the game played out if it was released. It's also my first article to be featured on the home page. 8 The Grubbs (partially found unaired Fox sitcom; 2002) October 2nd, 2018 My first new article after a five month hiatus and the first article I've written about a TV show. I find unaired TV shows to be fascinating and I think of this show as no exception. I partially wanted to cover this show because my family's last name is also Grubbs and it's interesting to see how a TV show can be cancelled because of negative critical reception before it had a chance to air. It's also my second article to be featured on the home page. 9 Zero Racers (lost build of unreleased "F-Zero" Virtual Boy game; 1996) February 2nd, 2019 My first new article for 2019 and also my first new article after a three month hiatus. I finally decided to make a new article on this game after looking through other cancelled Virtual Boy games confirmed to make it through at least the prototype stage of development and I thought that this game held my strongest interest to create an article for this game, since racing is one of my favorite video game genres. While I still think that the system's "red and black" display due to obvious technical limitations at the time are still ugly to look at, I think that this game could have the potential to be an interesting game for the system had it come out. It's also my third article to be featured on the home page. 10 Crowfoot (partially found CBS TV movie; 1995) March 23rd, 2019 I wanted to cover this rare, hard to find online, and obscure 1995 CBS TV movie that has never been officially released on home media in the United States thanks to Allison Pregler's (she is one of my online favorite reviewers in general alongside her boyfriend Phelan Porteous and James Rolfe) review of the film. I also found the concept of the movie interesting and left me wondering why this film never caught on to become a TV series. I have no new articles planned to be created at the moment for right now. I now have an account on Chattango as BrianG222 and on the LMW forums as Happy Brian (as you can take a look at my account there; I'm a proud VIP and Volunteer: http://forums.lostmediawiki.com/user/1224).